I can't remember the last time I scrapped wedding photos, so it was fun to work with the photos from our nephew Ian's October wedding. 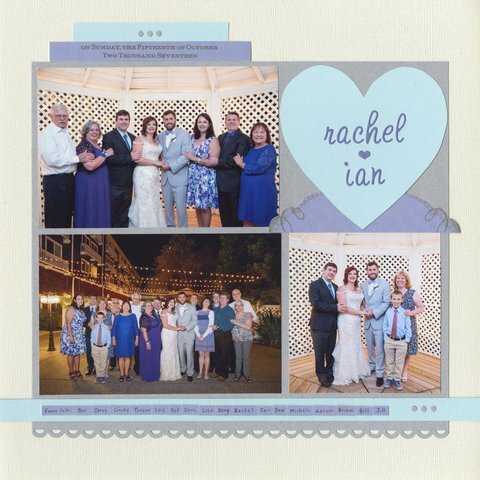 Almost everyone in the groom's extended family dressed in similar colors, which is a scrapbooker's dream. It made it so easy to pick my color scheme: pale blue, purple* and a sparkly silver and on a pearlescent background. Neither the sparkle nor the shimmer shows up in the scan, so you'll have to trust me. *The purple is actually the wedding invitation! I used part to anchor the heart, then cut the location and date from the text and adhered it to the top. Finally, I wrote my journaling on little rectangles that I cut from the scraps. It felt weird to cut the invitation apart, but I love that it's actually on the page. Such a sweet layout. LOVE the colours that the extended family dressed in! Ohhhhhhh this is beautiful! LOVING the colors and that you used a part of the invite!!!! !